Just like my friend, Jess, I've been a really bad blogger lately. Jess says she's been busy living...me too! Well, and I can also mention that after about a year, Netflix and Hulu have helped me catch up completely with Grey's Anatomy. It's the important things here, people. But really, almost two weeks without blogging. Seriously?! So, in effort to at least write SOMETHING, I will show you his royal cuteness in his trick or treating attire. I should mention that Herb and I went back and forth about how, as parents, to handle Halloween, specifically the not-so-adorable aspects of the holiday. 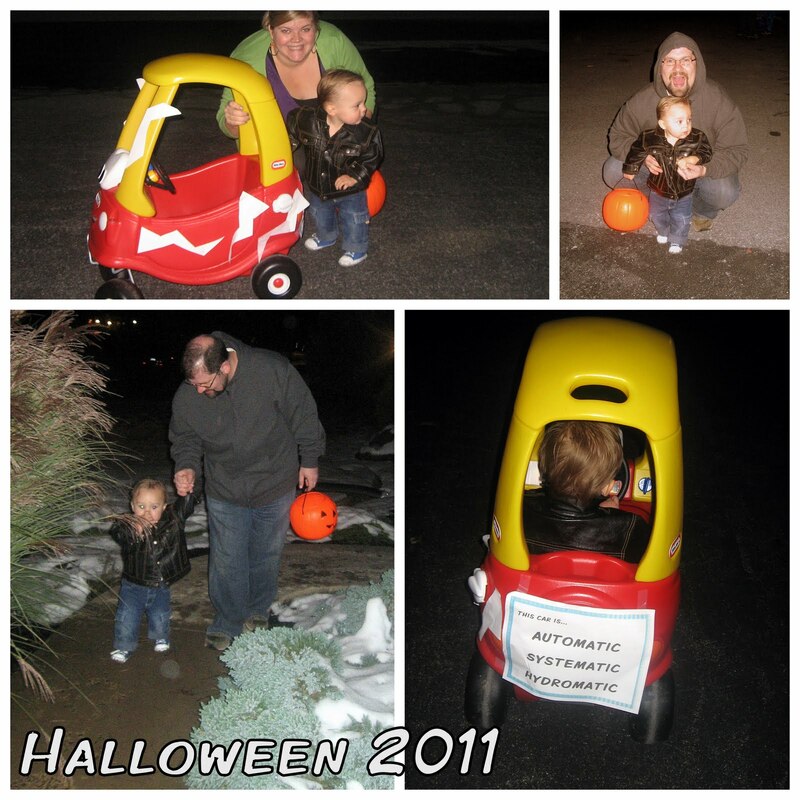 Ultimately, we decided the Americanized cuteness of costumes and toddling up to a door for some candy is okay for our family. At the last minute, I decided last week that Levi needed a costume, and so I ordered one online (MISTAKE). Of course, it didn't arrive until today (Nov 2). In the meantime, on Monday, at 4 pm, we decided to trick or treat anyway, therefore leaving me with 45 minutes to think of, and throw together, a costume for Levi. May I present you with Danny Zuko! Inspired by his leather jacket and love for the Cozy Coupe Greased Lightning. We went out for about an hour with the Blank Family (Goalie, Monkey, and Dino), who graciously loaned me a junk load of gel for Levi's hair. As for the candy, we saved three lollipops for Levi, shared a few fruit snacks with him, and then devoured the other 10 fun size pieces of chocolate on the car ride home. Anyone else make a last minute costume? !